Hi everyone! I’m Emily from Everything Emily and I’m sharing a super fun and easy DIY project with you today. A huge thank you to Liz for having me and I hope you all enjoy this post! 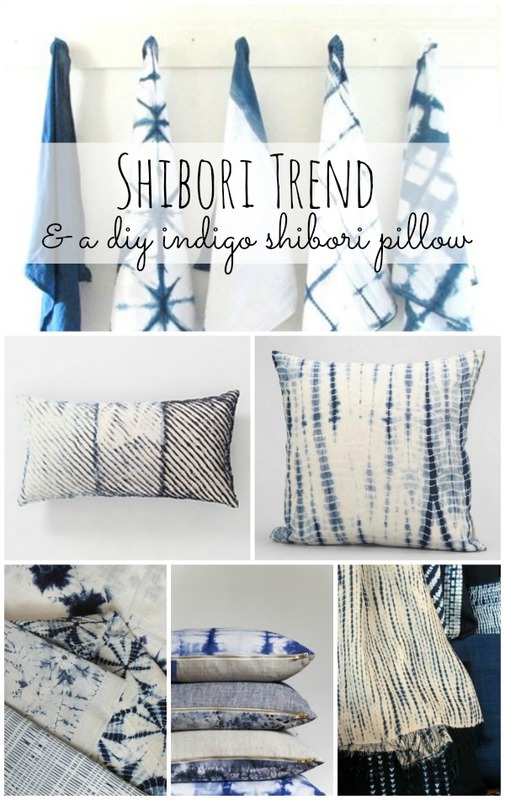 I’ve recently been obsessing over the Shibori trend and am seriously in love with it. 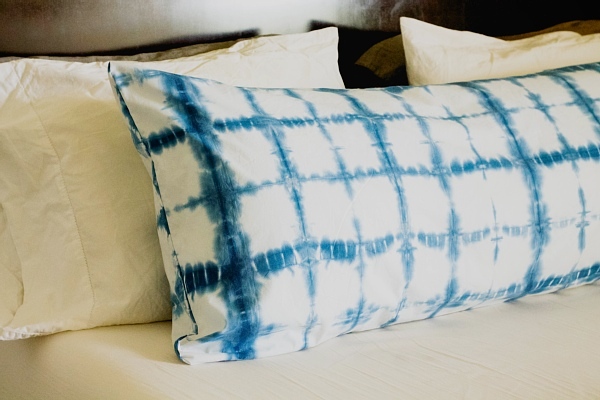 For those of you who don’t know, Shibori is a Japanese form of fabric dying where you use techniques such as twisting, folding, binding, and compressing fabric to create unique, beautiful patterns. The technique is easy do and the outcome is amazing. 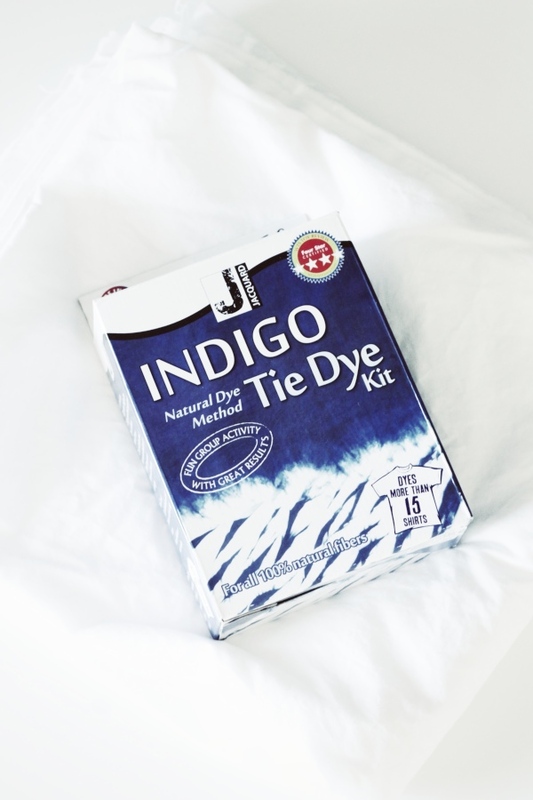 I’ve tried a few different Shibori dying techniques and with trial and error, have found that the Jaquarad Indigo Tie Dying Kit is by far the easiest thing to use. The kit is just under $12 on Amazon, comes with everything you need (rubber bands, wood, dye, and gloves, instructions, and pattern techniques), and is so much easier to use than having to purchase everything separate. This kit dyes up to 15 yards of fabric as well so there is plenty of dye. We live in a rental and our bedroom was seriously lacking some color. Since I’m limited to what I can do in the space I wanted to create something for our bed that would really give the room a “wow” factor. 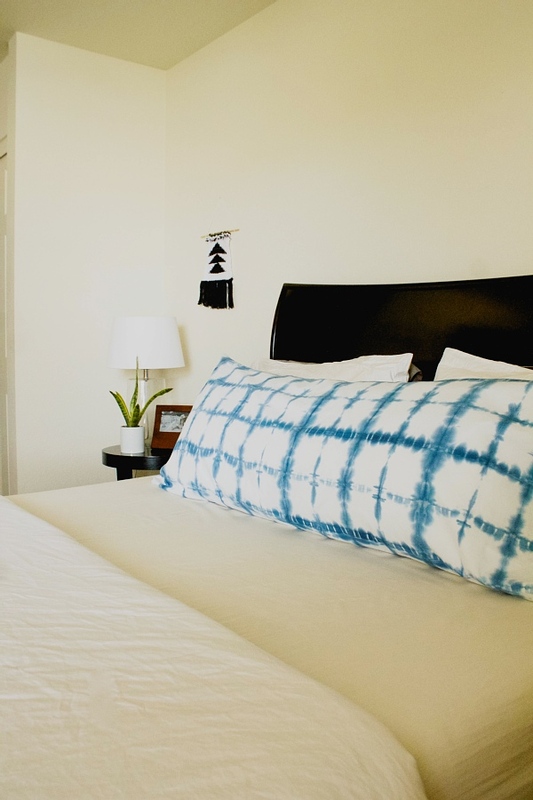 I love white bedding… I’m mean who doesn’t?! And needed something that would coordinate with it and my style. 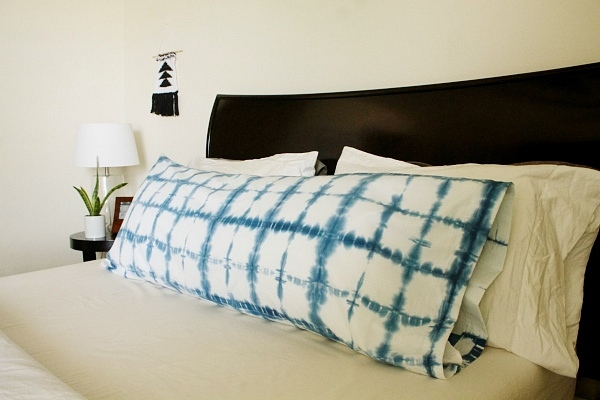 I decided to create a reversible Shibori pillow for our bed. I used a body pillow and sewed a pillowcase for it. That way I have two different sides incase I wanted to change things up and I can easily slip the case off and wash if needed. 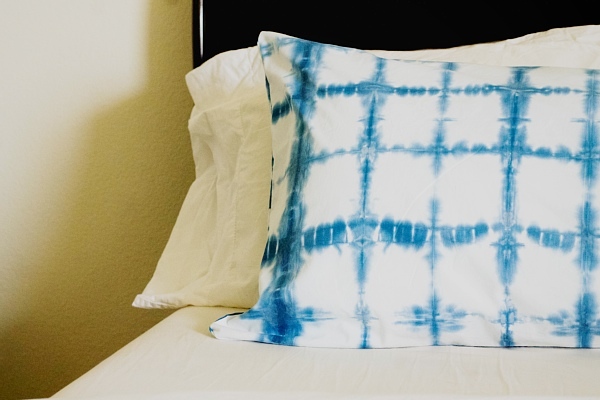 You can do a number of things with this dye and create anything from pillowcases, throw pillows, blankets, curtains, etc. 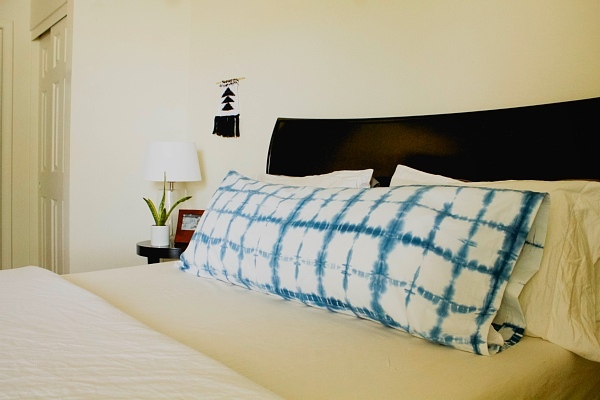 First you will want to prewash your cotton fabric and set up your dying area. This kit has step by step instructions that are easy to read and follow. 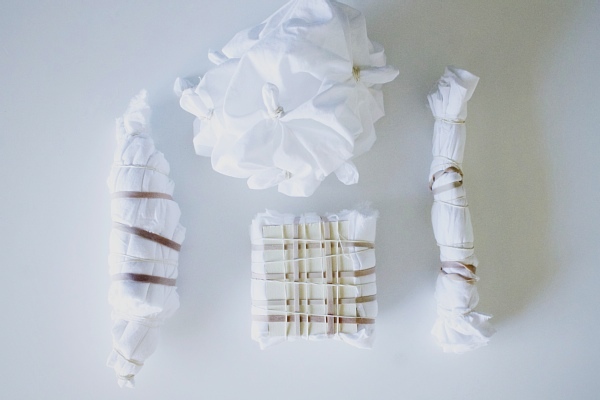 Next you will want to twist, fold, bind your fabric. This method will make for your fabric pattern. Follow the pattern guideline included in the kit. There are tons of unique different styles! 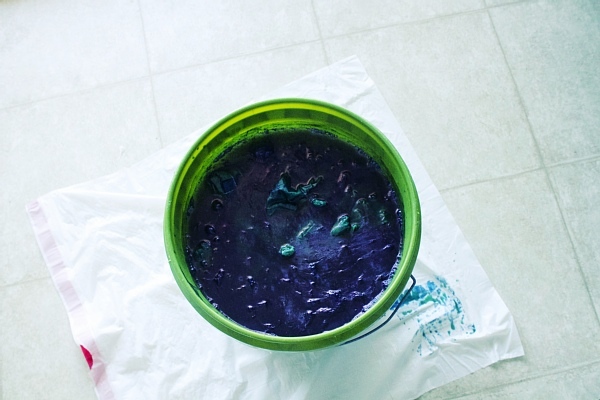 After you mix your dye, began to submerge your fabric into it. I left my fabric in for 45 minutes before taking it out. Once you remove the fabric from the bucket it will began to oxidize and turn into a beautiful blue indigo color. 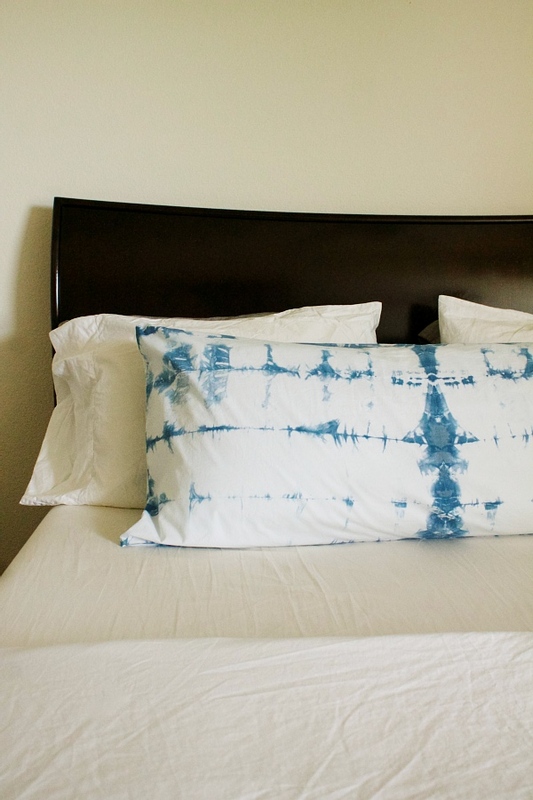 Depending on the color desire of your fabric, you can submerge the fabric back into the dye to obtain a darker shade. Once you are finished dying the fabric let it completely oxidize and then rinse with cold water. Wash, hang dry, and your done! Pretty easy right?! I hope you all enjoyed this little DIY project from Emily! Be sure to follow her on Instagram for updates on her sweet little family & all her lovely DIY projects. I’m loving this trend & really wondering where I can incorporate it in my home. I think it would be great in so many different rooms like a kids room, living room as an accent pillow, & maybe even the kitchen on some towels & more. What do your think of the trend? 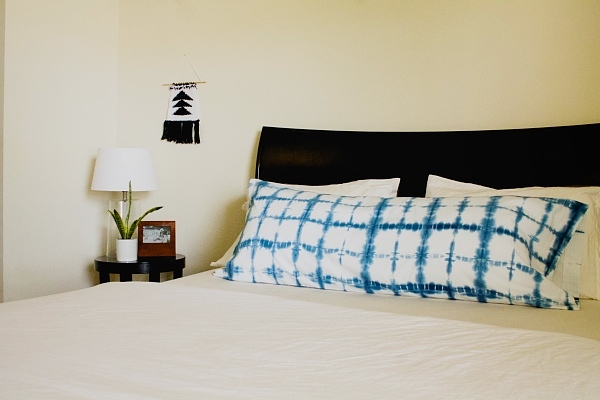 Do you have shibori in your home? Are you going to make it? Let me know in the comments below & chat with me on Instagram. How nifty! I love this look! It’s fresh & different & can either be paired with modern accessories or incorporated into traditional/ eclectic looks! Might just have to try this ! 🙂 Thanks for sharing! I LOVED this. It looks fantastic. Well done with that. After looking over a few of the blog posts on your web site, I truly appreciate your technique of writing a blog. Google while looking for a related subject, your site got here up, it appears great.